Having only recently decided to see if he could qualify to compete, the 20 year old from Putney, south west London, would encourage any other students with a disability to consider taking part in para sports. 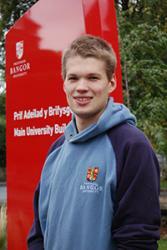 “I first started thinking about taking part in para sports quite soon after coming to University. A few friends had mentioned it to me before but I had never really taken much interest, I was quite content playing rugby union and cricket for my school and London Welsh RFC. However, I sustained a knee injury through overuse partly due to my disability. “I am a very competitive person and I find doing competitive sports helps to give me a release. I actually have found that I do better academically when I am taking part in competitive sport. Then my mind was set I was going to chase up getting classified in both sports. This is a lot easier said than done. I put myself on the swimming classification waiting list in February and I only got classified on the 5th October! Rowing was slightly more straightforward it only took 6 months! “I heard about Bangor University from a few friends, came up to an Open Day and then decided I would put it down as one of my choices and now I am here. "The best thing about my course is the variety of different topics we encounter during the course, while the best thing about the School is the atmosphere. There is a very friendly buzz around the School of Ocean Sciences. The highlight so far has been the Virginia Institute of Marine Science field trip I took part in this summer. Simply put it was a fantastic experience. Other than sports, I have been involved with the Endeavour Society and I am also currently the University’s Disabled Students Senator. Socially I enjoy the occasional night out. But mostly I just enjoy spending time with my good friends, wherever that maybe or whatever we may be doing. Leo is a former student of both Bethany School and St James Independent School for Senior Boys and reckons the best thing about living in Bangor is the proximity to the brilliant natural areas that surround the city.